Back when The Incredibles came out, you had to find a Disney Store if you wanted any decent figures. Same was true for Narnia. Since then the Disney Stores have been closing left and right, so thankfully for Pixar's latest offering, WALL•E, you can get good toys at the mass market. 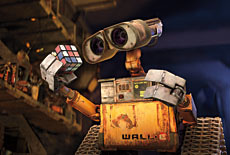 WALL-E (Waste Allocation Load Lifter, Earth-Class) is programmed to clean up the planet, one trash cube at a time. However, after 700 years he's developed one little glitch: a personality. He's extremely curious, highly inquisitive and a little lonely. 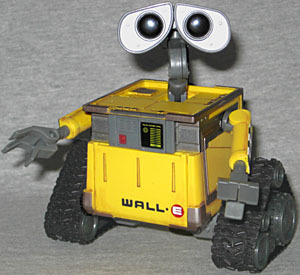 WALL*E comes to us from Thinkway Toys, which isn't exactly a household name among collectors. Looking at their website, they've mostly made roleplay sets and electronic talking banks. For their first foray into figures, this was a wise choice: when your main character is a boxy little robot, half the toy design work is already done for you. There are several categories of toys available, including Movie Scenes two-packs and multi-figure box sets, but the best offerings are the deluxe figures. Larger than the other figures, the deluxe toys are sold on nice curved blisters that show off the figure well. The top of the card is blue, and has WALL•E's big sad Frodo-eyes taking up ⅔ of the space. It's a smart design: it's hard to not buy something when the package looks sad when you leave it behind. 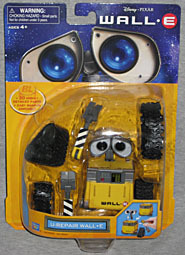 The yellow behind the figure has a pair of dirty treadprints, which is a nifty way to break up the space, and the package has the "BnL" logo of the Buy n' Large corporation, WALL•E's maker. Manufacturer. Whatever. There are, of course, several WALL•Es in each size class (can't just release one version of your main character, after all), but the best is "U-Repair WALL•E." When reviewing movie figures, we always look for the plainest, most vanilla version - that's the best representation of the character. In this case, that means the one that falls apart. Well, okay, it's not exactly that he falls apart, but that you can disassemble him. The figure is built from 20 pieces that pop together easily. 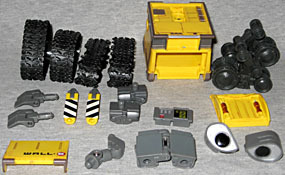 Honestly, everything comes apart - right down to the treads that can be removed from his little rollers. You can even break him down to his night-time storage cube. He's like a Build-A-Figure that's already built. A De-Build-A-Figure. The figure's articulation is very nice. The treads actually rotate as WALL•E rolls around, the fingers are hinged, the wrists spin, the shoulders have the range of balljoints, the neck is a swivel and a hinge, the head is on a ball, and there's a hinge in the middle of the head to allow his eyes to move - since WALL•E's head was based on a pair of binoculars, that really shouldn't be a surprise. 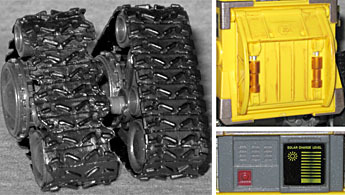 The front and back of the body open, so you can put trash inside to be crushed into a cube. The sculpt is impressive, capturing more details than you might expect. Even the underside is fully detailed. He has two sets of treads: one pristine, the other tattered and in need of repair. The back is designed to look like the rear hatch on a garbage truck, appropriately enough. The paint isn't just plain gray and yellow, but instead has a bit of a brown wash to make WALL•E look dirty. It's not quite as extensive as the wear and tear seen in the film, but it's better than making him look factory-new. He has his logo/name on his front, as well as his fully charged solar battery level. His eyes are black, and they're surrounded by silver. U-Repair WALL•E isn't a perfect figure, but he's the best around. When your other choices include one that has a spastic seizure and one that has a fire extinguisher embedded in his chest, the pull-apart limbs are a real win. Thinkway Toys has made a fine debut with these WALL•E toys. If you enjoyed the movie, then definitely check out the toys; there are some nice plain ones waiting for you.